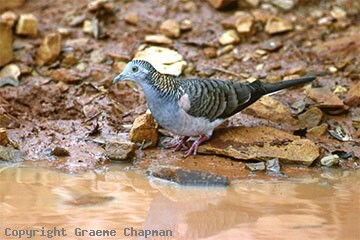 There are three subspecies of Bar-shouldered Doves in Australia - a small one from the Pilbara district of WA - another across the top from the Kimberleys to Cape York - and a third from coastal and sub-coastal eastern Australia, south to about Sydney on the coast and extending inland almost to the Darling River in NSW. They also occur in New Guinea. In recent times they have been extending their range down the south coast of NSW. 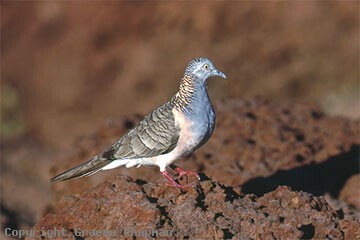 They adapt well to human habitation and at concentrations of food are fairly aggressive, holding their own against the introduced Spotted Doves and Crested Pigeons where they occur together. Male Bar-shouldered Doves have a bowing display when breeding ( see 032213D) during which the bare skin around the eye becomes a rich claret colour. They also mark their territory with a display flight, rising with a noisy flapping of wings to 20 or so metres, then gliding back on stretched wings. 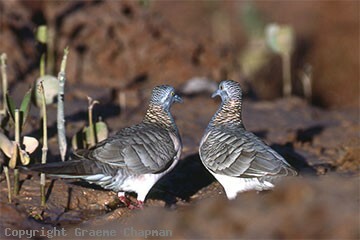 032001 ... Bar-shouldered Dove, Broome W.A. 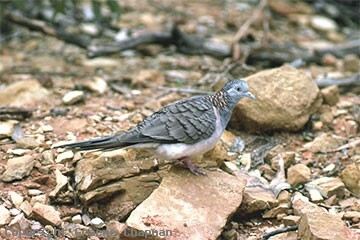 032003 ... Bar-shouldered Dove, Round Hill, N.S.W.